On today’s combined ride with Cycling Geelong we had ten riders: Ross Glover, Peter Jones, David Innes, John Hagan, Marie Bagley, Rolf Kohnot, Zdenko Coric, Pam Morrow and two from Cycling Geelong John Miro and Mike Curry. We rode on the rail trail to Curlewis Rd, where we turned right and continued on until the Bellarine Highway. 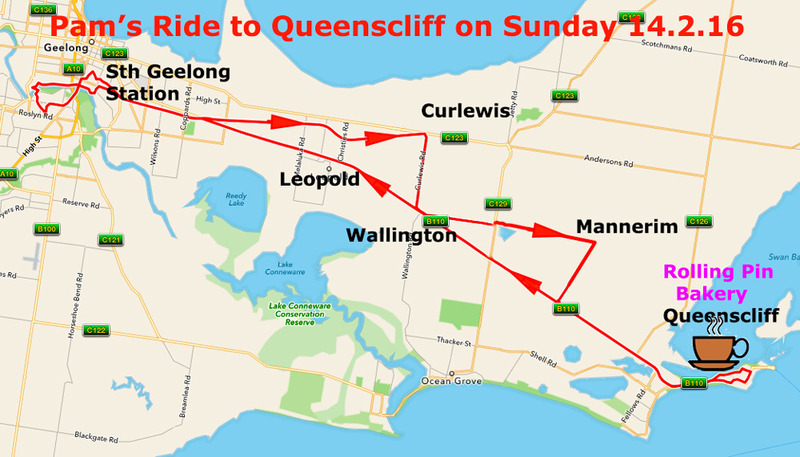 We turned along Swan Bay Rd until we reached Banks Rd again doing a right turn onto Bellarine Highway where we continued into Queenscliff. Coffee was enjoyed at the Rolling Pin Bakery. The return journey was into a head wind along the Bellarine Highway. Very pleasant morning. 76km. This entry was posted in Joint rides with GTC, Ride reports and tagged Bellarine Rail Trail, The Rolling Pin Queenscliff by hlyth2013. Bookmark the permalink.